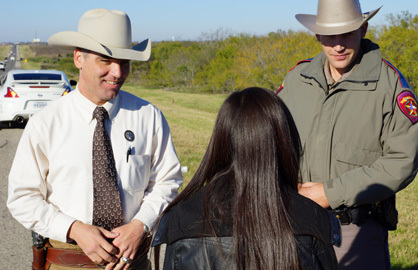 Texas Ranger Cody Mitchell and DPS Lieutenant Derek Prestridge co-founded the Interdiction for the Protection of Children (IPC) Program in 2010. The program has rescued over 100 missing and endangered children since its founding. This nationally recognized program trains troopers and other law enforcement officers how to recognize suspicious behavior in children and adults leading to the identification and recovery of abducted and missing children. Mitchell and Prestridge have traveled across the US training officers in other states. In addition, the IPC training has drawn interest from as far away as Canada and UK. Since the program’s inception, DPS has provided the IPC training to approximately 7,120 officers in Texas, nationally and internationally. Be able to establish the status of a child who may be abducted or endangered. Know resources available to them and courses of action to take when encountering an endangered child. Be able to identify research supported indicators of an endangered child and a high risk threat to children. Know the type of questions that need to be asked for a victim centered approach. Have a basic understanding of behavioral patterns of both suspects and victims. Know how to articulate their findings that are supported through research. Please click here to watch an interview with Ranger Mitchell about the program. Please note there is a brief segment about a Museum exhibit before the interview. Please click here to read more about the program.